← Thrown for a loop with allergies lately! In the previous post, I mentioned finding inspiration via the National Archives. Here’s the end result. 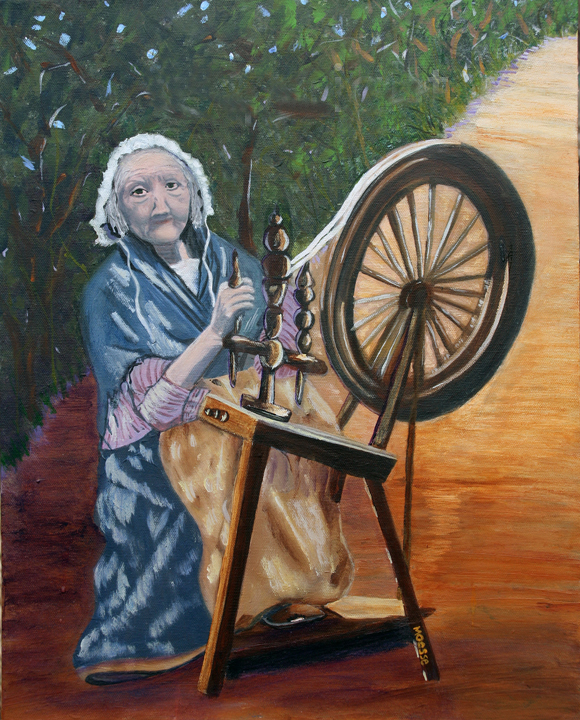 I call her “Regal Rose,” but the Archives file name was “Irish Spinning Woman.” I couldn’t NOT paint her. And truth be told she’s only the second figurative painting I’ve done. It was very hard, but I’m pleased with the results. Hope you enjoy her. The next paintings, below, are other ones I’ve done this month, trying like hell to shut out the news of conflagration around the world from Egypt to Madison, Wisconsin, to Tennessee. My brain, aware of the growing income disparity in the U.S. as indicated by the Gini Coefficient begs me jump in. But my heart and soul remind me I started painting to accept that there are things beyond my control. So, I hide out in my studio, switch my IPhone from National Public Radio to Pandora’s steady stream of tunes, and paint away. My mind bears the burden of guilt my heart and soul erase with yellow ochre and burnt umber. This entry was posted in Art Therapy and tagged Egypt, protests. Bookmark the permalink.